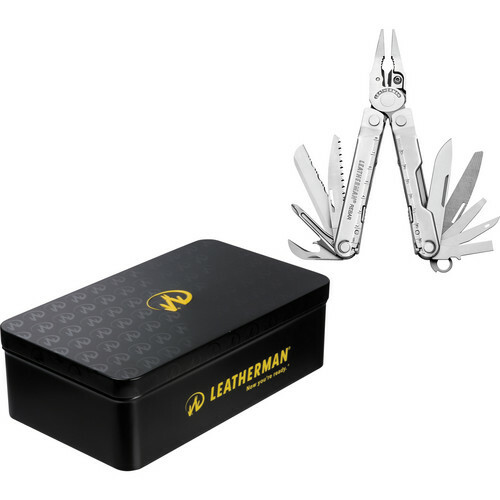 The Leatherman Rebar Multi-Tool features stainless steel construction with a stainless finish and 17 tools including the following: two 2.9" 420HC blades-straight and serrated, three screwdrivers as well as two sets of pliers, two sets of replaceable regular/hard wire cutters, and a wire stripper. When opened, each tool locks into working position. The lanyard ring helps keep the Rebar within arm's reach. The nylon sheath is made from ballistic material and has a touch fastened closure. It is worn on your belt in horizontal or vertical orientation and has three pockets/slots for accessories. The Rebar is assembled in the USA. Box Dimensions (LxWxH) 7.5 x 7.2 x 1.9"